Either it be a new job or a new client. This is the fool-proof process I put in place to get the initial understanding to build a foundation for digital marketing and communication. Find hurdles in the customer journey – and take appropriate measures to adjust these. If you want a head start on what questions to ask the website data – you can get some inspiration over here. If you don’t have the proper tracking in place, you will never be able to evaluate performance nor highlight the results your work have generated. Always ensure that there is tracking in place and most importantly that it actually works. If there is – great – then there is the next challenge and that is event tracking beyond the last KPI which is often conversion or lead. Identify key pages in the customer journey and make your KPI framework reflect this. If you don’t know who your customers are, their interest, driving forces, pain points and so forth. Then is hard to craft compelling and useful content, find the right marketing messages and start building that customer relationship that sets your company apart from all other companies offering the same product. Investing in getting the customer insight you need will pay off. It doesn’t matter how much money you invest – or throw away – on bought media if you don’t invest in a landing page that is streamlined, to the point, de-cluttered and easy to convert on. 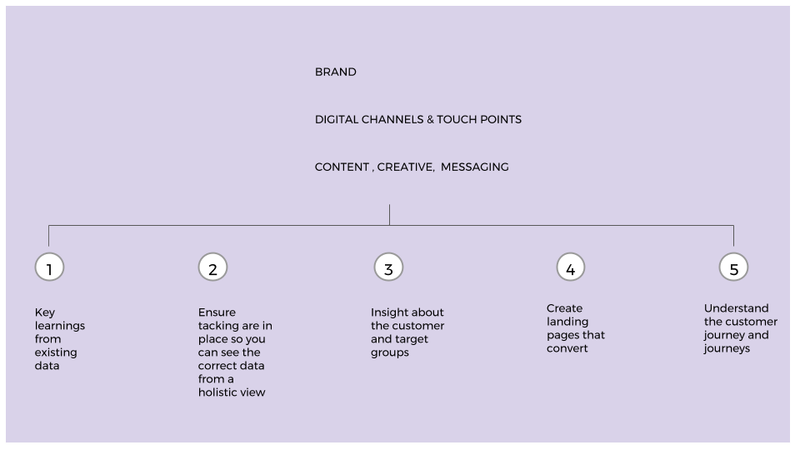 Identify key pages in the customer journey and ensure you have the right content, messaging and also event tracking and KPI’s to follow the customers and work actively and regularly with improving the customer journey and experience in all your digital touchpoints.